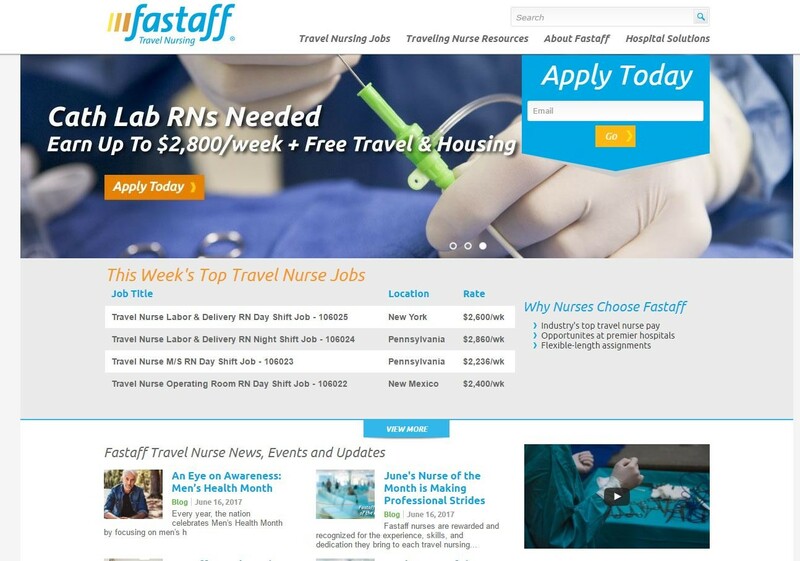 This quick user guide will walk you through the process of applying for a travel assignment with Fastaff, including how to upload required documentation in eStaff365 and accessing the Fastaff Nurse Portal. If you have questions at any point of the process, you can always call us at 1-800-736-8773. We recommend using a Chrome or Firefox browser when completing your application and accessing the Nurse Portal. View the New Nurse Application Guide or the Nurse Portal Guide. Navigate here to reset your password. An email will be sent to that email address from fastaffsg@fastaff.com. View the email and click on the provided link. Enter your email and a new password that is at least 8 characters long. 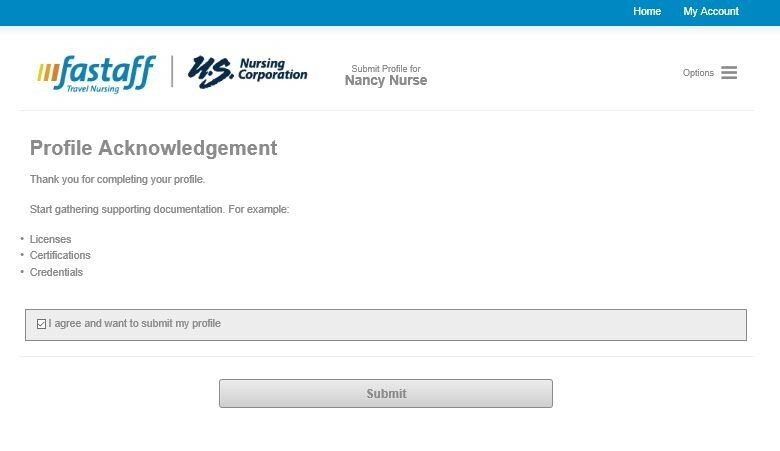 You should now be logged into the new Nurse Portal. If not, please call us at 800-736-8733 for support. 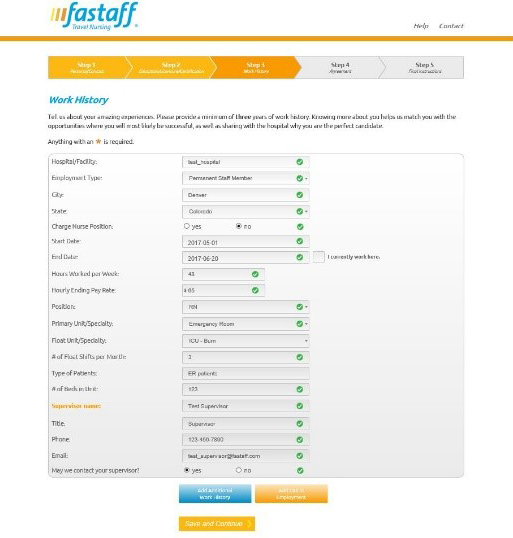 Navigate to Fastaff.com. 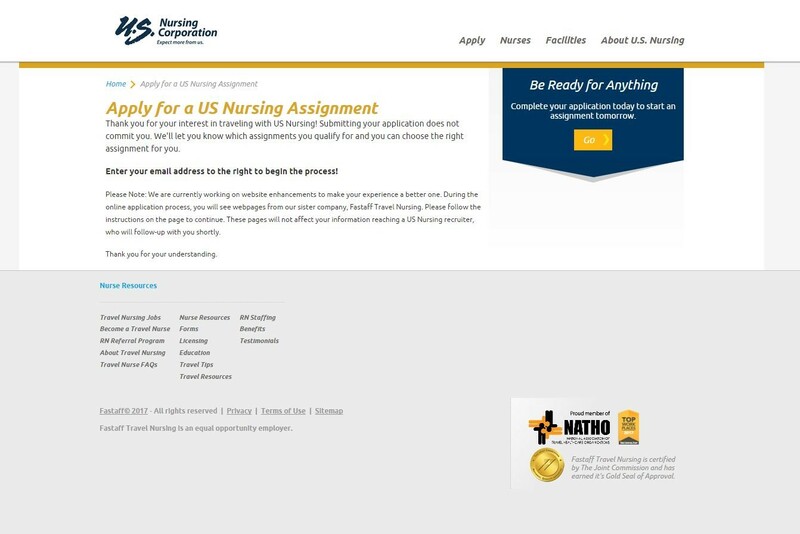 If you are coming from USNursing.com, the steps below will be the same, but your login page will look a little different. Enter your email address in the ‘Apply Today’ section. Click ‘Go’. The ‘Apply Today’ form will expand. Fill in your first and last name, along with your phone number and a password of your choosing. Click ‘Go’. The ‘Apply Today’ form will expand once more. Fill in your information. Fields marked with an asterisk are required. Click ‘Go’. You will be directed to a welcome page. Click on the ‘Next Step. Complete Application’ button. You will be taken to a login page. Login using the credentials you created on step two. If you receive an error trying to login to the online application, and you’re sure you typed your username and password properly, chances are you need to reset your password before you can continue. We’re sorry for this inconvenience, but you will only need to do it once. Reset your password by clicking here. 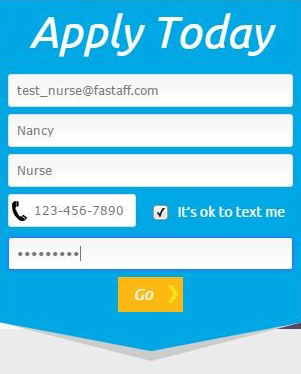 If you need assistance with this step, refer to the Fastaff Nurse Portal User Guide. Once you have logged in, fill out your personal contact information in the required fields. Click ‘Save and Continue’. 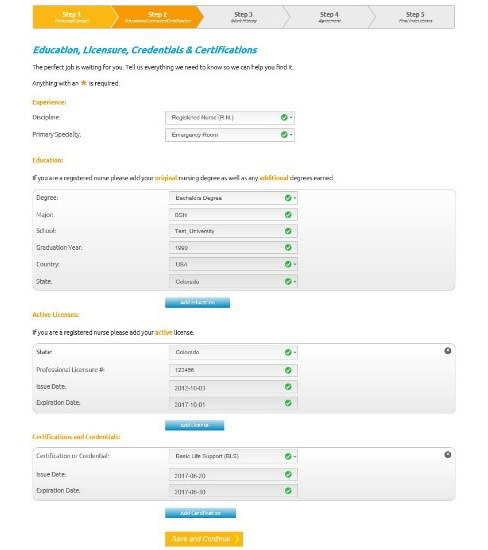 On the next page, fill out your education, licensure, and certification information. Click ‘Save and Continue’. On the next page, complete your work history. Click ‘Save and Continue’. On the next screen, you will see a summary of your information. If you need to edit your information, click the blue ‘edit’ button in each category. If everything looks correct, click ‘Save and Continue’. On the next screen, you will see a message confirming your completion of your application. 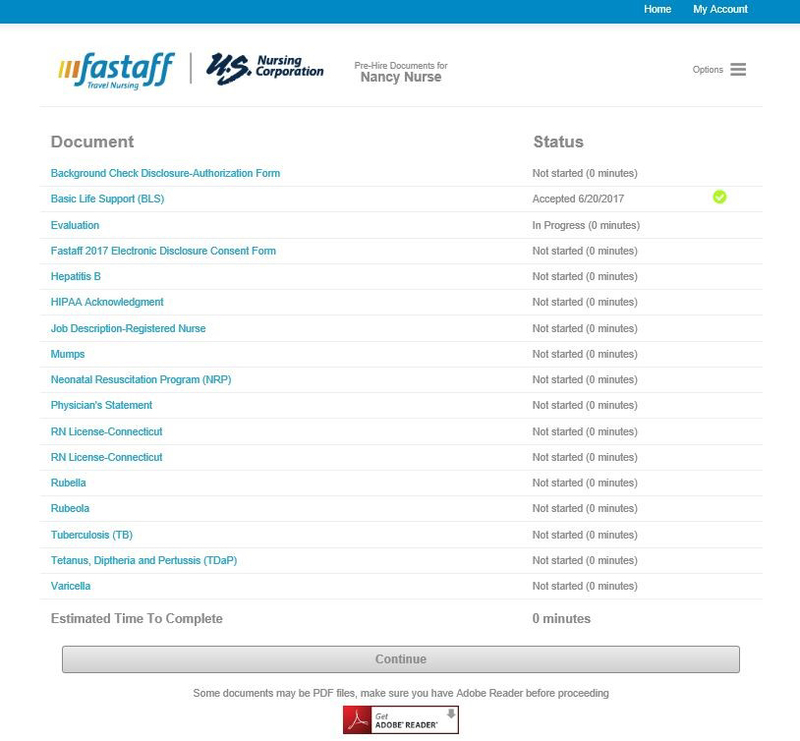 You can access eStaff365; where you can upload your documentation, by clicking the link titled, ‘online document storage system called eStaff365’. 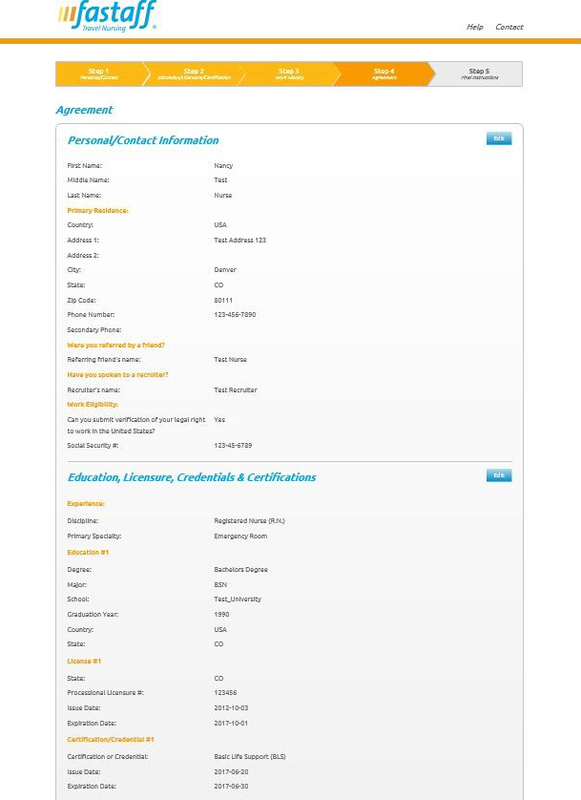 eStaff365 is a secure portal that allows you to safely upload your required documentation, such as your licenses and certifications. 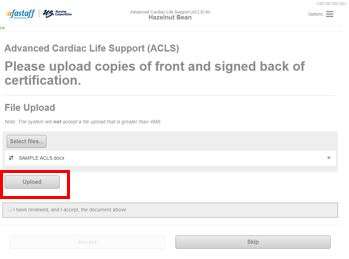 When you first login, you will be presented with a screen that shows two buttons: ‘Complete Profile’ and ‘Review and Sign.’ When you complete both sections, these buttons will display two green checkmarks. 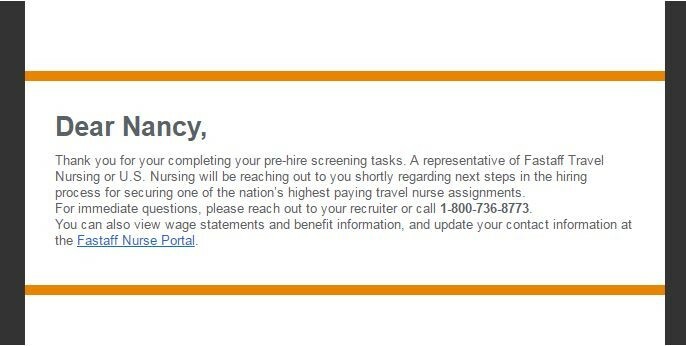 Click ‘Complete Profile’ to start the process of your Pre-Hire Screening documentation upload. The next screen will take you through a process of filling out your personal information. When completed, click the ‘Next Step’ button. A popup will appear, asking you to confirm your legal name. If any information is incorrect, click ‘No’ to go back and edit. Once you confirm your personal information, you will be taken to a screen that asks you to submit your information and to start gathering your documentation, including licenses, certifications, and credentials. 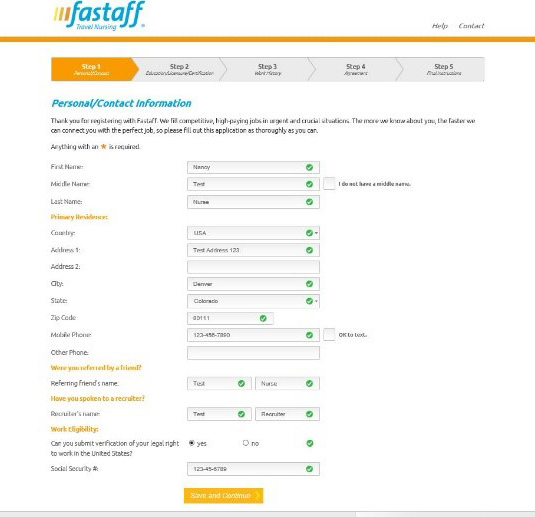 Once you submit your information, you will be directed back to the first eStaff365 screen. This time, you will see a green checkmark next to the ‘Complete Profile’ button. You will see a red number next to ‘Review and Sign’, indicating that you still need to complete this step. Click the ‘Complete Profile’ button to get started. 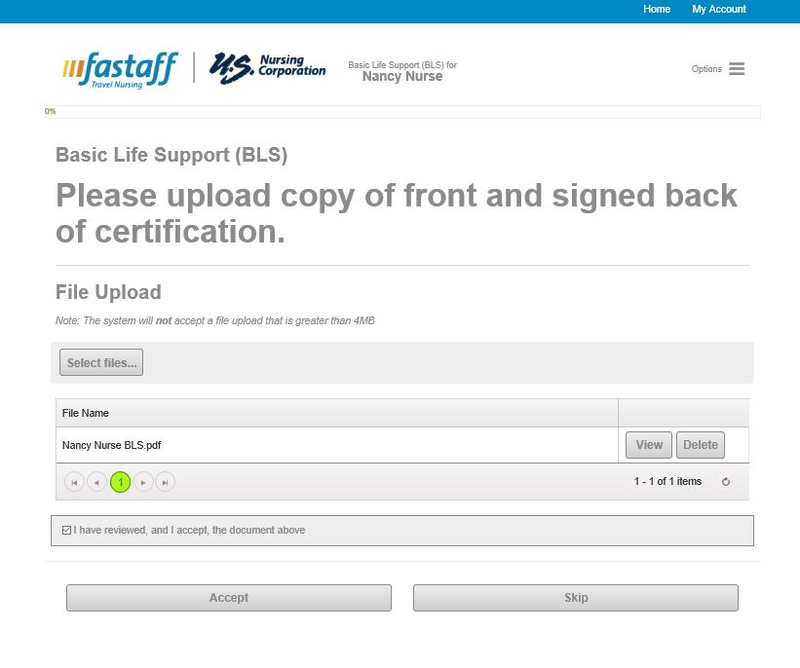 The next screen will show you a list of the required documentation you will need to upload. This may look different depending on your specialty. Click ‘Start’ to upload each document, clicking ‘Next’ to navigate through each document upload. A green arrow will appear under ‘Status’ when you have completed each document upload. When uploading your required documentation to eStaff365, you will see a button titled, ‘Select Files’. Click this button to upload your document. Once completed, a button titled, ‘Upload’ will appear. You will need to click this button to start the upload process. When your document is finished uploading, you will see the file name appear under ‘File Name’. Select the checkbox titled, ‘I have reviewed and I accept, the document above’ to finish the file upload and move to the next. 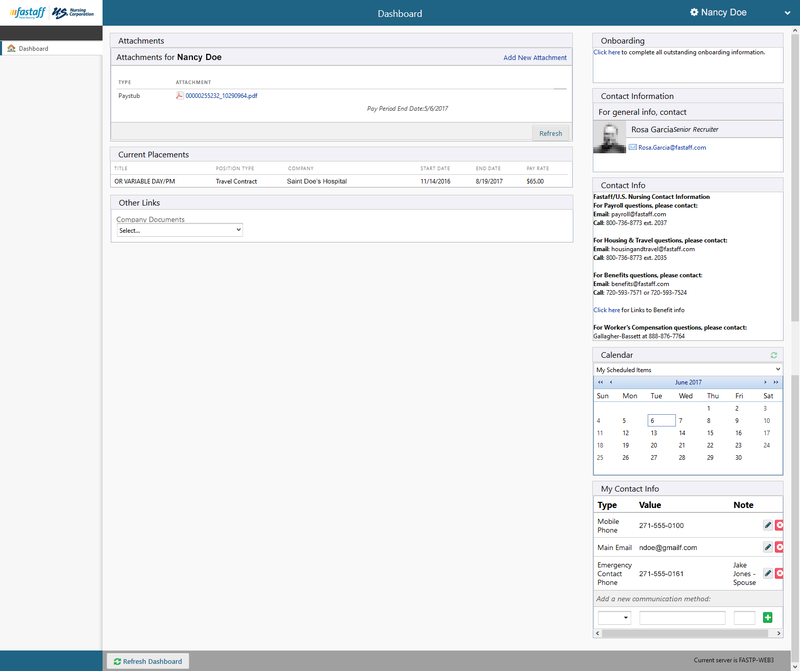 Once you have uploaded all your documentation, you will see the below screen that shows the two green checkmarks, indicating your work in eStaff365 is complete. 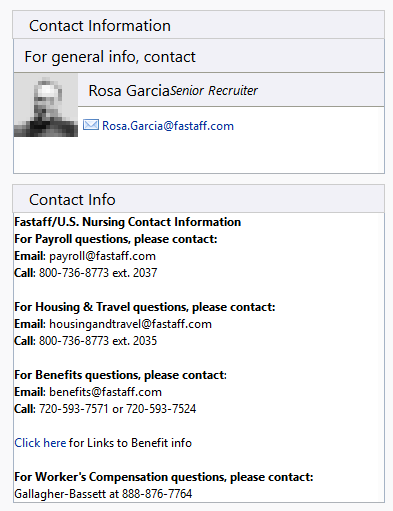 A confirmation email will be sent to the email address you provided, which includes a link to the Fastaff Nurse Portal,where you can view all of your documentation, access your paystubs, and more. 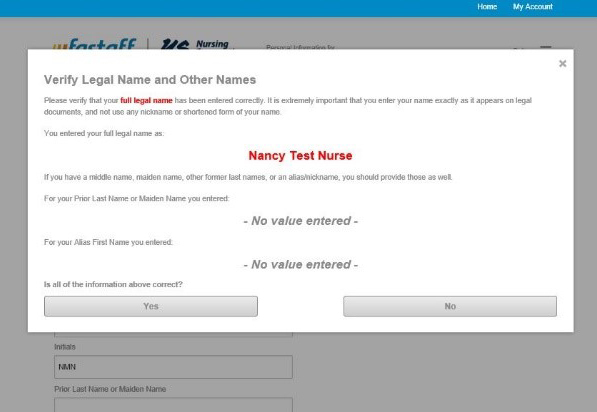 You can access the Fastaff Nurse Portal two ways: the first is by following the link in the email sent to you after you complete your pre-hire screening tasks. 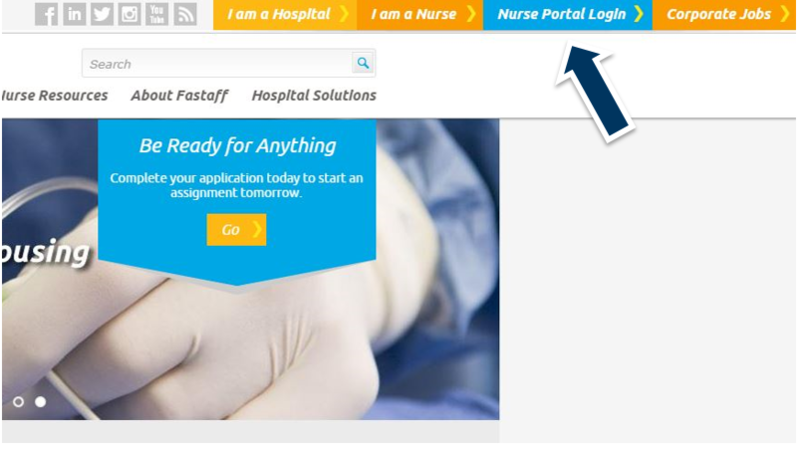 The second way is by following the button, ‘Nurse Portal Login’ on the Fastaff homepage. 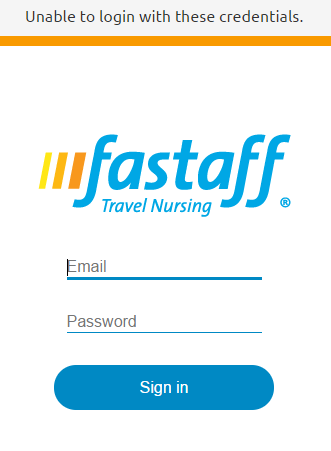 When you login to the Fastaff Nurse Portal, you will be directed to your dashboard, which displays your personal information, onboarding information, and assignment details once you are accepted to your first travel assignment with Fastaff. 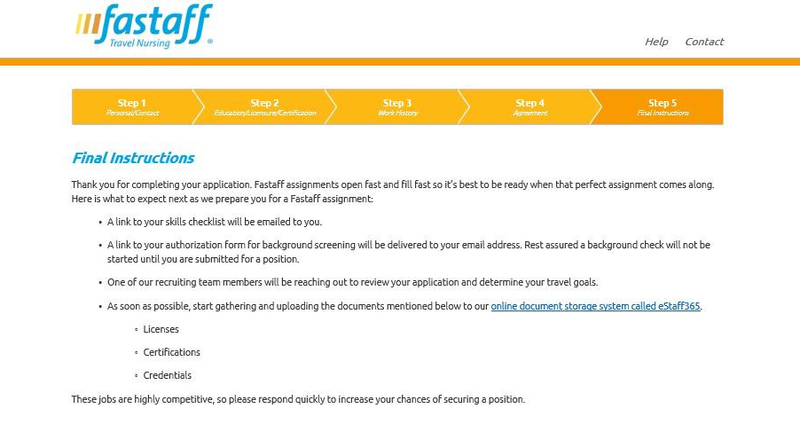 We hope this guide serves as a helpful resource as you start the process of becoming a traveler with Fastaff. Thank you for your interest and for being the first to serve in urgent and crucial situations. Fastaff and U.S. 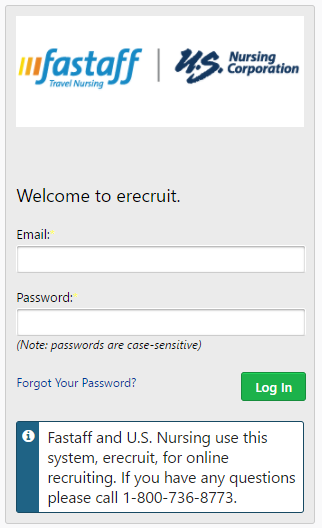 Nursing have relaunched the Nurse Portal in an online recruiting system called Erecruit. This quick user guide will familiarize you with the most frequently performed tasks of the nurse portal, but you can always call us with questions at 1-800-736-8773. We recommend using a Chrome or Firefox browser when accessing the Nurse Portal. All users will need to reset their password before accessing the new portal for the first time. You won’t be asked to do this again. 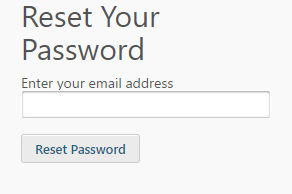 Once you have initially reset your password you can login. Enter your email address and new password to login. Current wage statement information will be available as a PDF link on the Nurse Portal. Past wage statements dated before June 17, 2017 will be available at https://my.nursejob.com. View information about your upcoming contracts. See different available resources such as benefits info, FAQs, etc. by clicking on the down arrow. Click the down arrow to change your password. Find your recruiter’s contact information and photo. Reach out to other departments directly. By clicking on the pencil of each item, you can update your contact information. 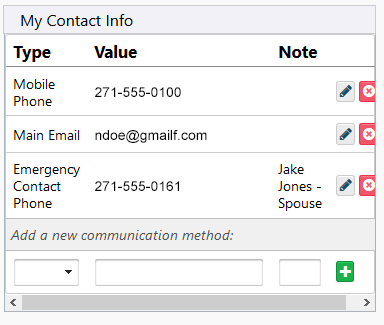 You can also add new methods of contact as well as additional emergency contact info by clicking on the green plus sign.